We are a well known manufacturer of Fermentation and Storage System. 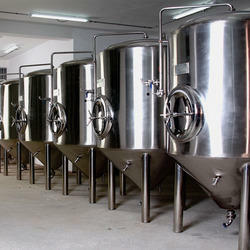 We are counted amongst the most prominent names of excellent quality Fermentation and Storage System. Our offered range is constructed using SS 304 or SS 316 as desired, designed as cylinder conical tanks with cone angle between 65 to 72 degrees. These products are equipped with dimple jacketed glycol cooling system and insulated with 50 – 60 mm polyurethane foam. Fermentation and Storage System are fitted with high quality solenoid valves that regulate tank temperature. Our fermentation tanks are constructed using SS 304 or SS 316 as desired, designed as cylinder conical tanks with cone angle between 65 to 72 degrees. These tanks are equipped with dimple jacketed glycol cooling system and insulated with 50 – 60 mm polyurethane foam. Tanks are fitted with high quality solenoid valves that regulate tank temperature. The cooling surface includes the cone and cylinder area. Independent cooling for cone and cylinder areas can be optionally provided. All tanks are fitted with high quality RTD sensors for accurate temperature indications. Tanks are also optionally equipped with sampling outlets and inspection glass with light. 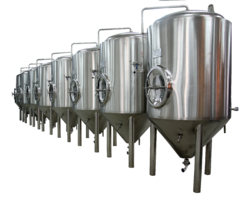 Tanks are available from 200 liters to 2000 liters in the microbrewery range, and larger capacities for full scale brewery. Looking for “Fermentation and Storage System”?